Item Size: 6" x 9"
This convenient Night Drop Envelope sometimes referred to simply as a Drop Envelope is a real money maker for auto dealers and repair shops. We've several stock designs and styles available for this classic dealer supply item. Choose between standard style and standard with yellow highlighting. 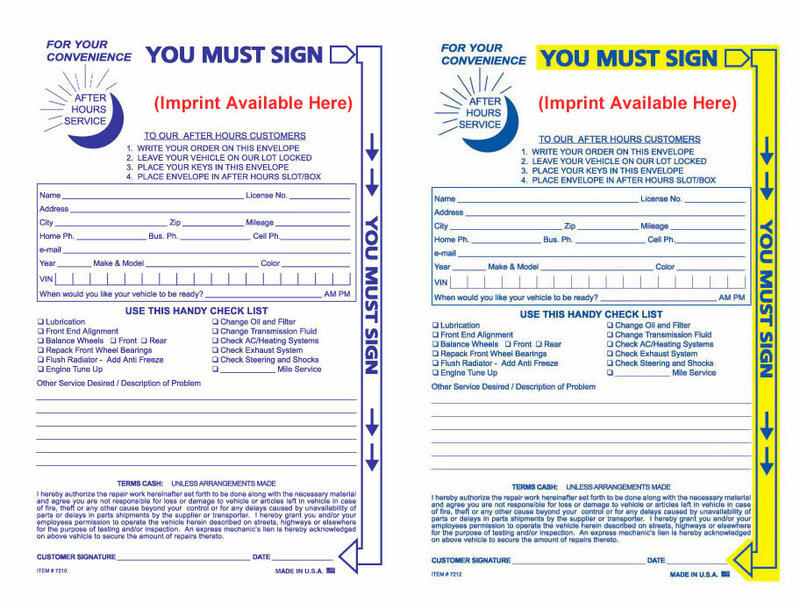 This Night Drop Envelope can be custom designed to match your specific business needs, or purchased now with the generic design pictured. To place a custom order, please call 866-348-6414. Ask about our free design service. Allow an extra 7 to 10 working days for production if you choose the imprinted option. We will email you a PDF proof for your approval before production begins. Please feel free to call us at any time with questions. Ink Colors: Pricing is based on 1-standard imprint ink color. Call for pricing on additional colors. COMPARE OUR PRICE to Great American Automotive Products. THEY'RE MORE EXPENSIVE … American's Price is 100 @ $50.00 (#BFA6595) … for the same item. Very Satisfied with service. Received products in a timely manner. Good Products. Always in stock when i need them. Lighting Fast Shipping! I will continue to use Estampe for my Automotive paper needs. Easy to order online, very timely delivery, good quality, and competitive pricing.